Green Horse Art for The Children's Trust charity auction was held in Mary Ward House in Bloomsbury on the 3 April 2014 at 6.30pm and Kaddy Lee-Preston conducted the auction. Mary Ward House, a Grade I listed building, was designed as a settlement and built in 1897. The founder of the settlement was Mary Ward, a distinguished Victorian novelist who signed her books as Mrs Humphry Ward. Apart from her successful writing career Mrs Ward was also a leading social worker and promoter of equalisation in the society. 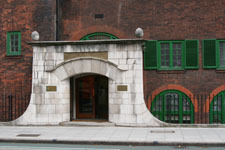 The venue which is now a conference and exhibition centre has a long history of social work. It was in this building that the Play Centres started as well as the first school for disabled children was founded. Because of this strong connection between the auction venue and the fundraising beneficiary we feel this was the right place for our event. We are very grateful to the management of Mary Ward House for letting us use this fascinating space for our auction.